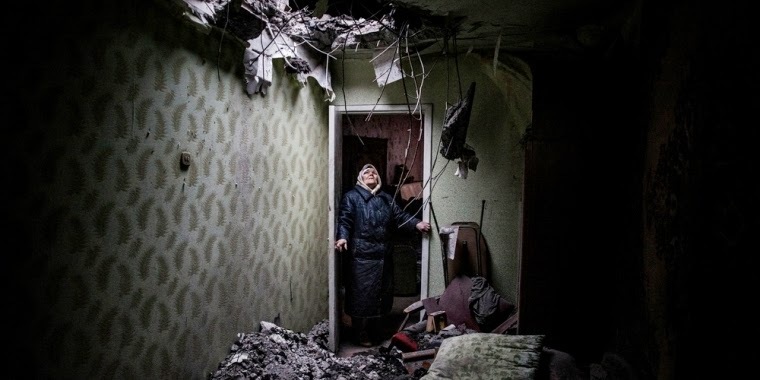 Galina, 86, looks at the hole where a shell hit her apartment in Kievsky district in Donetsk, Ukraine. "'m a surgeon, but I have never in my life seen so many amputaded people- people go shopping and one hour later they are without their legs,The surgeons here -who have never had to deal with war -wounded before -are having to carry out at least one or two amputations every day." I arrived in Gorlovka six days ago and went straight to the hospital. The main operating theaters up on the sixth floor are no longer functioning because they’re just too dangerous with all the shelling. There’s one working operating theater on the ground floor. Every day they receive between five and twenty victims of shelling. Last week, 60 injured people were brought in on one day. But for three days there was no running water in the hospital, and so they had to cancel all but the most urgent operations. Without water, you can’t sterilize anything. The city isn’t in ruins, as the shells and rockets don’t destroy buildings completely, though smaller houses in the suburbs can collapse. But all the buildings have shattered windows—an issue when the temperature goes down to 10 below zero at night. Yesterday we passed a children’s playground with scorch marks on the ground from where a shell had exploded. And there are bomb craters everywhere, including one right in front of the children’s hospital. But you hardly see any children. Most of the families with small children have left. It feels like a ghost town. Most of the shops are closed, there are no cafes or restaurants. If people have to go out, they walk very swiftly. No one stands around unless they’re waiting for a bus. MSF first came to Gorlovka in September  and since then, my colleagues have been regularly providing this hospital with much needed medical supplies and drugs. When the conflict escalated in January, we decided to have a team based here so we could directly support the local doctors to provide emergency surgical care to influxes of wounded. Every hour or two, a shell or rocket hits somewhere in the city, completely randomly. Most victims are hit in the open air, when they’re walking down the street or waiting for the bus. Inside houses, you’re mostly safe as long as you stay away from the windows. Two days ago, a house 200 meters from where we are living was hit. We were woken at 5 a.m. by a sudden blast. The windows were shaking, and we knew it had to be a bomb. I jumped up, gathered some essentials together—my computer, reading glasses, penknife, and warm clothes—and ran down to the basement for shelter. I’d already stashed an emergency medical kit downstairs. At times like that you’re just waiting for the next blast to happen. "At Times You're Just Waiting for the Next Blast to Happen"
The hospitals are running out of basic medical supplies. Doctors in other hospitals have told us they have no surgical sutures left, so the surgeons are stitching people up with fishing line. As the water supply worsens due to the shelling, diarrhea amongst infants is increasing, but the children’s hospital has run out of the infusions they need to prevent dehydration. Supplies of all sorts of drugs have run out—we’ve been asked for insulin, antibiotics, disinfectants for wounds—we’ve already received a huge list of things they urgently need beyond what we’ve already brought in. But getting supplies into the city is not easy. Gorlovka is basically surrounded by the frontline, and can only be reached on one narrow entry road. The area gets shelled often, so it’s dangerous to pass through it, and frequently it is closed. I’ve visited three hospitals in the city [that] are still functioning, but many health centers and clinics are closed, partly due to the shelling, but also because around half of the medical staff have left the city. Those who remain haven’t been paid for seven months. The past six days have been really overwhelming for me. I’m a surgeon, but I have never in my life seen so many amputated people—people go shopping and one hour later they are without their legs. The surgeons here—who have never had to deal with war-wounded before—are having to carry out at least one or two amputations every day. It’s difficult for the hospital staff, but they are coping remarkably well. Like the rest of the people here, they have a very stoic attitude. They are very brave, very calm and contained; they are doing their best to cope. But you can sense that underneath they are very close to desperation. They feel abandoned by the outside world. Apart from MSF, there are no other international organizations here. People are desperately waiting for a sign from the rest of the world that they haven’t been forgotten.